Our handmade bridal bracelets can add a delicate touch. Pink is a popular color this season. This beaded bracelet contain Swarovski crystals, rh.. This bracelet is made with a blend of faceted and smooth jade purple beads, Swarovski crystals.. The beautiful faceted teal and agate beads accented with Swarovski crystals and rhinestone rondell.. Need a yellow dressy bracelet to go with you beautiful dress or gown? This bracelet could be t..
Add more sparkle to your look with this green Swarovski crystal bracelet which is made on expandab..
Feel pretty and glamorous wearing this sparkly Swarovski crystal bracelet. It is made on expa.. 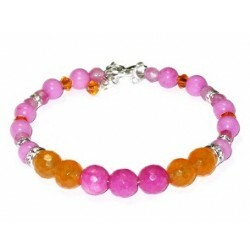 This bracelet has a mixture of pink and lilac keshi pearls that are accented with faceted freshwater.. This elegant sage and mint green bracelet contains freshwater pearls, Swarovski crystals and k.. This delicate and feminine pink bracelet contains Swarovski crystals, keshi pearls and freshwa..